Save big on health care ... even when your body starts falling apart. (Money magazine) -- It's inevitable -- as you age, your body requires more repair. 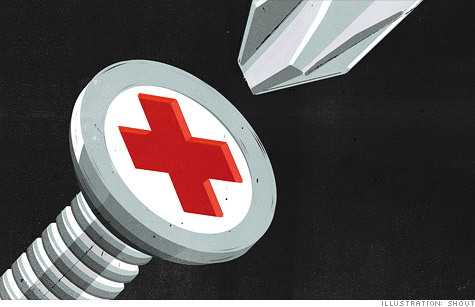 But there are ways to lower your medical costs. .
Money magazine gives you strategies to cut your costs by as much as 70% in six big areas -- from doctor visits to prescription drugs to dental care -- that are major sources of cash drains. This is the second of a two-part series on how to lower your medical expenses. Oh, that aching back. And knee. And shoulder. According to the National Center for Health Statistics, more than 40% of 45- to 64-year-olds have had joint pain in the past 30 days alone; one-third had lower back pain in the previous 90 days. To ease such musculoskeletal aches, doctors commonly recommend physical therapy. Two or three visits may suffice for a simple back strain; you often go twice a week for a few months after surgeries like rotator cuff repairs. In-network co-pays typically run between $20 and $30 per visit or $160 to $240 a month for a fairly standard two-session-a-week treatment schedule. Those on a high-deductible plan paying full fare will typically spend $100 to $200 for an hour-long session. Manage your insurer. Since physical therapy can potentially stave off the need for surgery, some firms have been upping PT benefits, says Mark Olson of Towers Watson. To qualify, you usually need a recommendation from your doctor. Then your insurer must approve the care -- prior to your start and based on your condition -- and okay a set number of visits, which could be as few as three or four or as many as 12 or 15. Most will approve additional visits as long as your doctor or physical therapist makes the case for it and there's no cap on benefits, says Jim Winkler of benefits consultant Aon Hewitt. Be your own therapist. To cut down on the number of visits, have your PT put together a program with more exercises than you'd normally do at home. "It's up to you to have the self-discipline to really push yourself," says Nancy White of the American Physical Therapy Association. You'll need to check in every few weeks to see how you're progressing and to modify your exercises accordingly. Pay in cash. If your bill isn't covered, your therapist may be very willing to reduce her price, says Joel Press, a physiatrist at the Rehabilitation Institute of Chicago. Thanks to a 2008 parity law, if you work at a firm with over 50 workers that offers mental health coverage, the benefits must be on par with the company's other medical coverage (that is, your insurer can't restrict the number of therapy visits it pays for unless specialist visits are similarly restricted). That's good news for the legions of middle-aged folks overwhelmed by the juggling act of their lives. Thirteen percent of people 50 and older received mental health treatment or counseling in the past year. And countless more may not even know what ails them. "Often people come in complaining of physical symptoms and don't recognize that it is stress-related," says Glen Stream, president of the American Academy of Family Physicians. Your co-pays or co-insurance should run the same for a therapy visit as for a primary-care or specialist appointment. Facing a high deductible? You'll pay $65 to $200 an hour for individual appointments. See if you can get it for free. More than 80% of large companies have employee assistance programs, which often offer workers three to eight sessions with a mental health counselor at no or low cost. That may be enough to help you through a temporary rough patch, such as the loss of a loved one, says Olson. Your boss won't find out: By law, these sessions must be kept confidential and cannot be noted in your personnel file. Pick in-network. When most insurers limited coverage, it may have made sense to start your search for a therapist by asking friends or family for referrals. Now you should look for someone to treat your depression the same way you'd seek a doctor to treat your asthma, by starting your search within your insurer's preferred provider network. Savings: You'd spend $520 for six months' worth of weekly visits with an in-network therapist on a plan with a $20 in-network co-pay, vs. about $2,000 or more for an out-of-network doc. Get the right diagnosis. One loophole in the parity act: Since no standard definition of "medically necessary" exists in mental health, insurers can opt not to cover certain conditions, such as those not considered "biologically based" like relationship problems or an eating disorder. So grief counseling to help handle the death of a loved one might not be covered, but the depression that might arise from that loss probably would be, says Sarah Steverman of the nonprofit Mental Health America. If your insurer refuses to pay your mental health bill, ask how they define "medically necessary" and the reason your claim was denied (by law they must tell you); if you think you're being denied benefits unfairly, ask your doctor to write a note explaining how your malady fits within your insurer's definition. It turns out you may not be done paying the price for all that Halloween candy you ate as a child. "When you're over 40, your teeth and fillings have simply incurred more mileage," says Dr. Matthew Messina, a spokesman for the American Dental Association. Metal fillings often need to be replaced with a costly crown or, if several teeth are damaged, a bridge. More than half of people over 55 have periodontitis, which can lead to decay and infection, according to the American Academy of Periodontology. Those childhood cavities look like a bargain now. The average porcelain crown costs around $1,000, according to the American Dental Association; a three-unit bridge may reach $3,000. A deep periodontal cleaning will run you at least $600 for your whole mouth. Most insurance covers routine cleanings and exams twice a year, but the good news ends there. Standard coverage for crowns and bridges is often just 50%, and 60% to 80% for fillings. Many plans also have low annual maximums of just $1,200 (or less), which might not cover a single "major restoration" or other procedure a year. Play the calendar. "Dental care is usually something people can budget for," says Messina. If you're looking at, say, a $2,400 crown and you are close to your $1,200 annual max, ask your dentist if you can get a temporary crown and push the permanent work into the following calendar year. Savings: In the prior example, you'd save at least 50% of the cost of the crown. Let Uncle Sam help. Before open-enrollment season each fall, make an educated guess about what your out-of-pocket expenses will be for next year's dental work. Then put an amount equal to your costs into your flexible spending account at work or into a health savings account (if you have a high-deductible insurance plan). That will reduce the net cost of the procedure by 30% to 40%, depending on your tax bracket. Alternatively, if you're looking at a several expensive procedures (say, in addition to your own dental work, your teenager needs orthodontia or your spouse also needs a couple of crowns), bundling them into a single calendar year might allow you to take a medical tax deduction. You can write off health care expenses (including dental work) if they exceed 7.5% of your adjusted gross income on your federal income taxes. While that dental bill might still smart, a tax break can go a long way toward softening the bite.